​Flu is the short term for influenza. It is an illness caused by a respiratory virus. The infection can spread rapidly through communities as the virus is passed person to person. When someone with the flu coughs or sneezes, the influenza virus gets into the air, and people nearby, including children, can inhale it. The virus also can be spread when your child touches a contaminated hard surface, such as a door handle, and then places his hand or fingers in his nose/mouth or rubs his eye. The flu season usually starts in the fall and ends in the spring. When there is an outbreak or epidemic, usually during the winter months, the illness tends to be most pronounced in preschool or school-aged children. Adult caregivers are easily exposed and can come down with the disease. The virus usually is transmitted in the first several days of the illness. After the first few days of these symptoms, a sore throat, stuffy nose, and continuing cough become most evident. The flu can last a week or even longer. 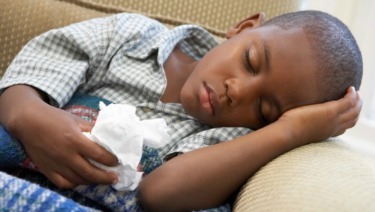 A child with a common cold usually has only a low-grade fever, a runny nose, and only a small amount of coughing. Children with the flu—or adults, for that matter—usually feel much sicker, achier, and more miserable. Children who appear to have the greatest risk of complications from the flu are those with an underlying chronic medical condition, such as heart, lung, or kidney disease, an immune system problem, diabetes mellitus, some blood diseases, or malignancy. As these children may have more severe disease or complications, they should, when possible, avoid other children with the flu or flu-like symptoms. Their pediatrician may suggest additional precautions that should be taken. If your child has flu-like symptoms along with any difficulty breathing, seek medical attention right away. There can be serious complications, even death, from the flu, but thanks to the flu vaccine these are less common. For all children who don't feel well with the flu, lots of tender loving care is in order. Children may benefit from extra rest and drinking lots of fluids. If your child is uncomfortable because of a fever, acetaminophen or ibuprofen in doses recommended by your pediatrician for his age and weight will help him feel better. Ibuprofen is approved for use in children six months of age and older; however, it should never be given to children who are dehydrated or who are vomiting continuously. Everyone should get the flu vaccine each year to update their protection. It is the best way to prevent getting the flu. Safe vaccines are made each year and the best time to get the flu vaccine is the late summer/early fall or as soon as it is on hand in your community. The flu virus spreads easily through the air with coughing and sneezing, and through touching things like doorknobs or toys and then touching your eyes, nose, or mouth. Click here for some tips that will help protect your family from getting sick. Only the Inactivated (killed) vaccine, also called the "flu shot", given by injection into the muscle, should be used for influenza vaccination this season. There are two types of inactivated flu vaccine based on the number of flu virus strains it contains: A trivalent (3 strains = two A and one B viruses) and a quadrivalent (4 strains = two A and two B viruses) vaccine. There is no preference for the use of either of these formulations. Any of these vaccines should be given as available in your area. The American Academy of Pediatrics recommends that an influenza vaccine be given annually to all children starting at six months of age. Children 6 month through 8 years old may need two doses of the vaccine given at least four weeks apart. Children 9 years of age and older only need one dose. Flu vaccines are especially important for children at high risk for complications from the flu such as those with a chronic disease such as asthma, heart disease, decreased immune system function due to a primary condition or from medications such as steroids, renal disease, or diabetes mellitus. All eligible children may receive the inactivated flu shot. All also adults should receive the flu vaccine yearly; this is especially important for adults who live in the same household as someone who has a high risk for flu complications or who care for children under the age of five. The flu vaccine has few side effects, the most common being fever and redness, soreness or swelling at the injection site. Although flu vaccines are produced using eggs, influenza vaccines have been shown to have minimal egg protein so that all children with presumed or confirmed egg allergy may still safely receive the flu vaccine unless they have had an allergic reaction specifically to the flu vaccine before. Talk with your doctor if you have any questions. Antiviral medications are available by prescription to treat an influenza infection. Your pediatrician can help decide whether or not to treat the flu with an antiviral medicine. Antiviral medications work best if started within the first 1 to 2 days of showing signs of the flu. However, in some children with increased risk for influenza complications, treatment could be started later. Is younger than 6 month old.